A test of ChessFlash diagram mode; I just fixed a bug to not display the initial board covering "Click to Play" as there is no PGN to download and no moves to play. Basic members receive an initial 10 problems and are then limited to 2 endgame problems a day. Silver members receive 20 problems a day and Gold members can do an unlimited number of endgame problems each day. A good deal at any level but it did prompt me to upgrade my silver membership to gold. Update: Something that I knew but that these problems demonstrate is that I am lousy at Queen vs. Rook endgames. It is not uncommon in practice and four of my misses have been in that category out of, I think, five attempts. 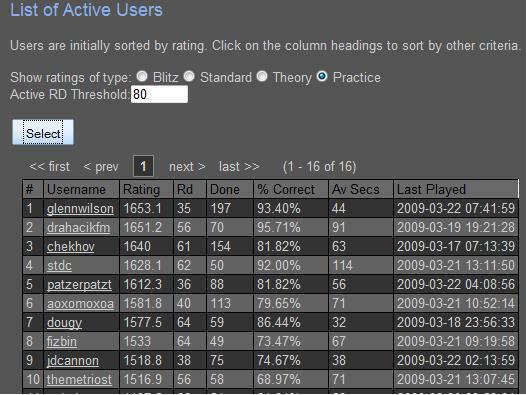 Here is a screenshot with my current (but temporary) position atop the new Practice category at ChessTempo. In Planning Exercise (1) BDK shows a position and asks about planning in such a position. There are many useful ideas in the comments. The position is pretty drawish and White has many moves that leave the position drawish. If White is happy with a draw here there are many simple options. But how should one approach playing for a win in such an even and simple position? Simple is a relative term. What two GMs consider a simple draw may be very complicated to me. What I think is a simple technical draw may be winnable against a Class D player. To win a game of chess your opponent must make a mistake (generally believed but not proven). That is true from the beginning position and it is true from any "drawn" or "even" position. So, when playing for a win the goal is to induce a mistake in your opponent without making a fatal error yourself. Is a simple threat the right way to proceed? If your opponent misses it you win, but what if he or she sees and counters the threat? You have to consider what the position would be if your opponent plays well. As always. You should not play assuming your opponent will make a mistake but you may play in a manner that makes it more likely that they will. In other words, seeking to complicate the position while still maintaining the balance is a reasonable approach but an unsound sacrifice (hoping your opponent misplays it) is not. Creating pressure or long term threats is another way to induce errors. On the other hand, what if the situation is that you must win the game at any cost? Then there may come a time when the only way to avoid a dead draw is to take greater risk. There may be a point at which they only rational way to continue to play for a win is to play unsoundly. Although many say that you should play the position and not the opponent when you have a choice of plans then knowledge of your opponent and his or her strengths and weaknesses is very valuable. Knowledge of self is also crucial. Back to BDK's position, the plan I hit upon involved moving "my" rook off the d-file to keep more material on, to better keep the opportunity to complicate later. I like giving up the d-file to my opponent as it seems non-orthodox and may be a surprising "retreat" but there is little value to the d-file. Some others found different plans to their liking. What, if anything, do the various plans tell us about their authors and their approach to the game? How would various GMs proceed here (or in a suitably more complicated position to make it of more interest to them)? What does that tell us about their approach to the game? Would a Tal and a Capablanca approach the question the same? Would they arrive at different plans or would they agree on a "best" move / plan? Is there a right way to think about such positions?